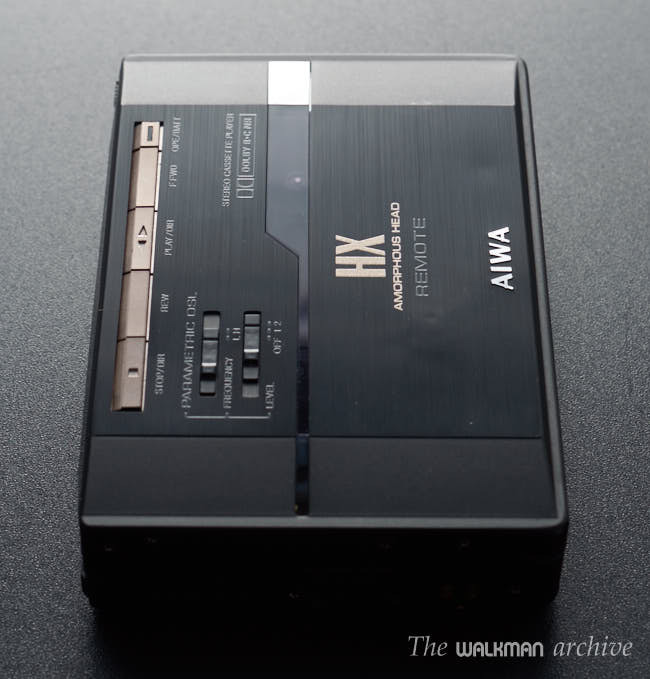 With the PX303, the best player in their '89 catalogue, AIWA evolutioned the personal cassette player into a higher and more advanced level that came with some impressive technologies. 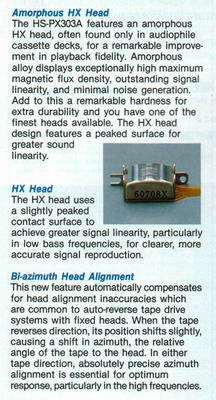 One of them was the brand new HX Amorphous Narrow gap head. 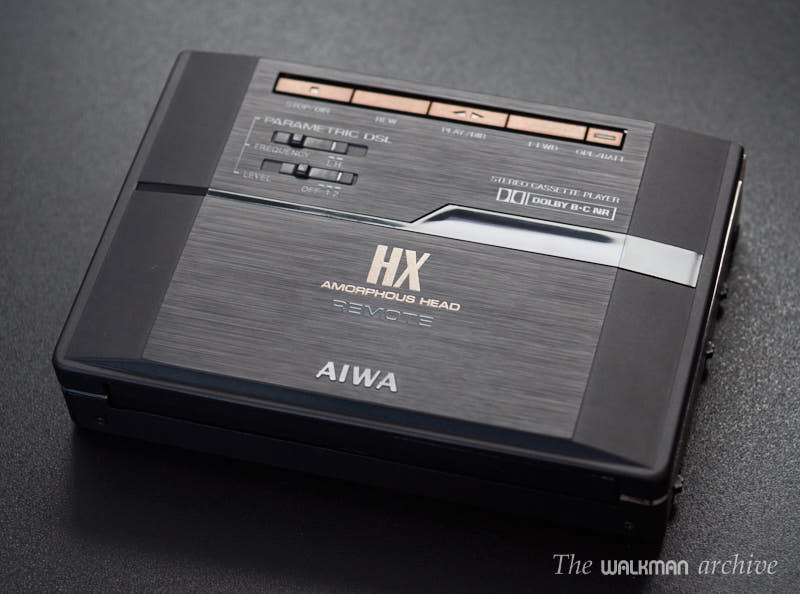 This new head (that was used by AIWA for the first time in the ultra-rare HS-PX20, only released in Japan) offered a better high frequency response thanks to the amorphous alloy and the narrow gap shape. 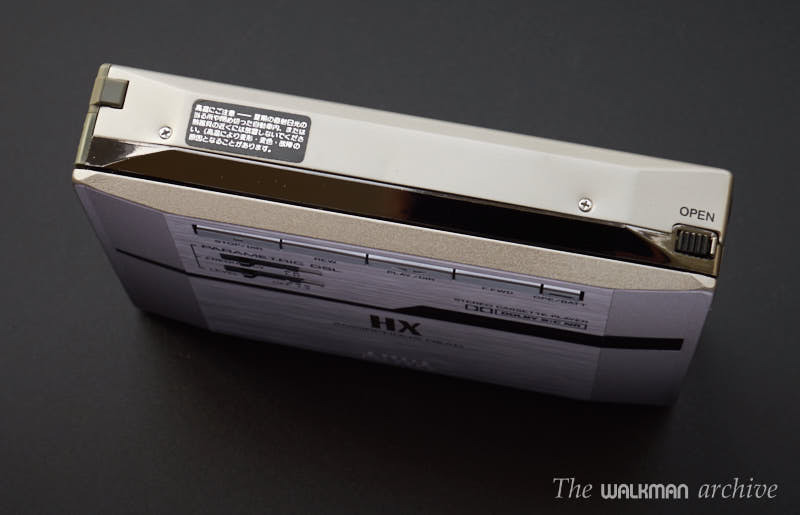 This high frequency improvement can be easily heard when comparing against the PX101. 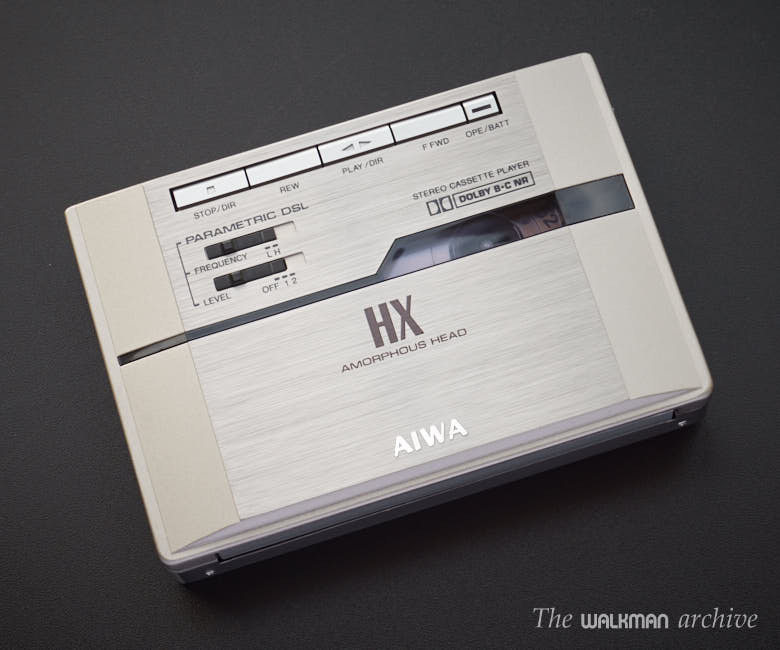 Anothe improvement was the bi-azimuth system, that allowed to precisely adjust azimuth independently to each side of the tape, which was an absolute new technology in the AIWA line. 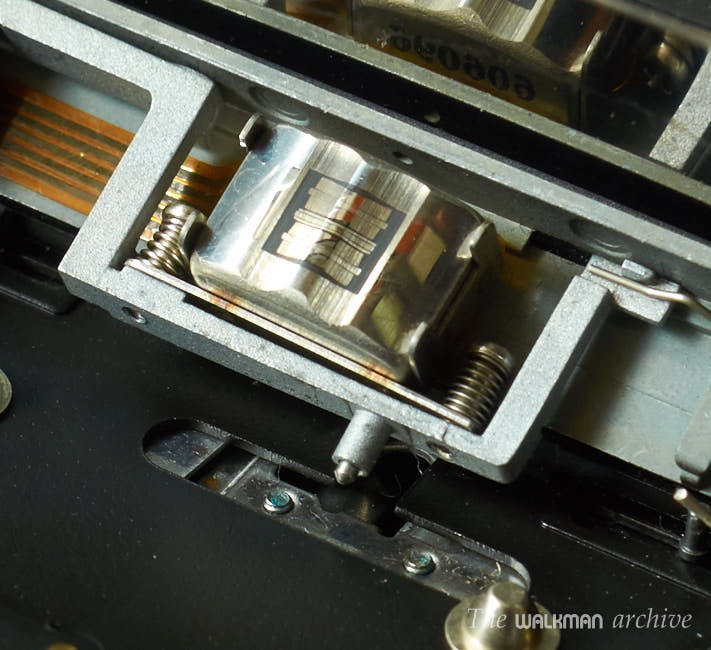 This feature allowed to solve a common problem: misadjustments of the azimuth on the other side of the tape. With it you can adjust precisely so it matches perfectly to both sides. 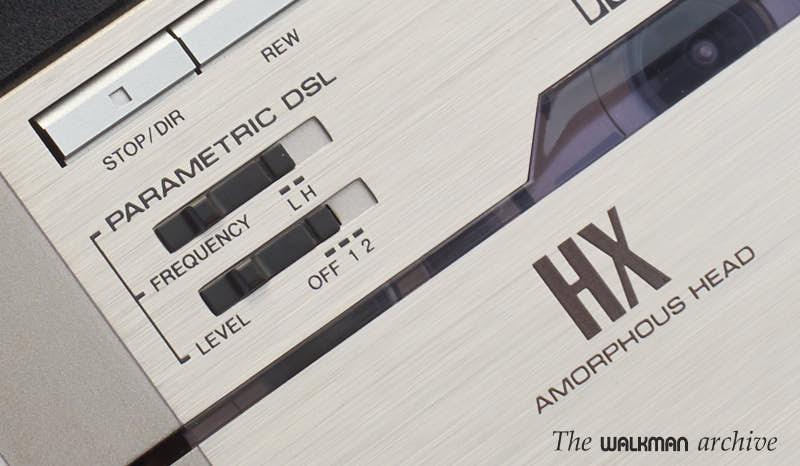 Detail of the HX Amorphous Narrow gap head and the bi-azimuth mechanism (the pivot below the head). Detail of the Parametric DSL switches. In my opinion it's the only one walkman that has such a deep bass enhancement that is close to the legendary Boodo Khan. I appreciate it a lot and it's one of my favorite players, thanks to that DSL. Although I'm not a 'basshead', I find it very useful when you're in some noisy environments a good bass enhancement that allows you to keep feeling that bass, without making it excessive. The silver version, only released in Japan. 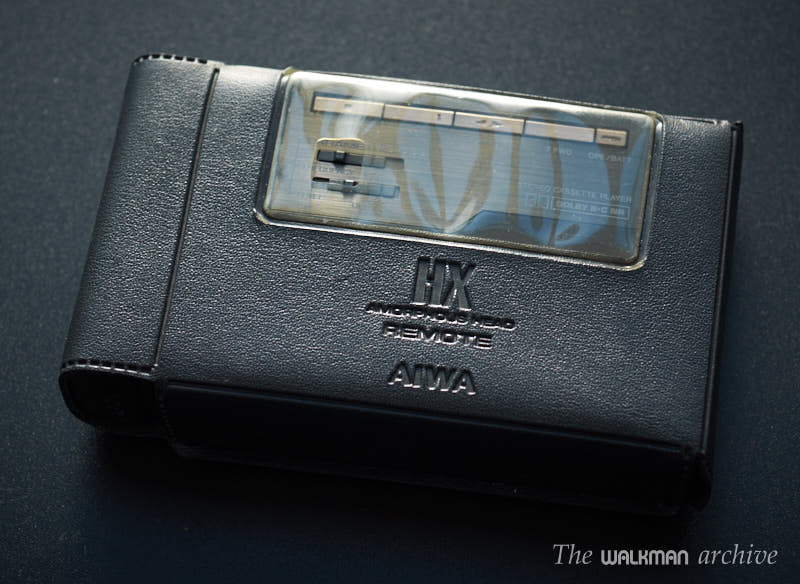 As many other advanced models from this brand, it used plumb batteries (particular the PB-3 ) which offered a quick charge (as quick as 15 minutes for 2 hours of playing) but sadly these batteries are all dead nowadays. Lucklily all these models had an external detachable battery compartment that allowed to use two AAA standard batts, which is the one that everyone uses today. Similarlly to the PX101, the PX303 came with a good, big pair of headphones that featured a remote. 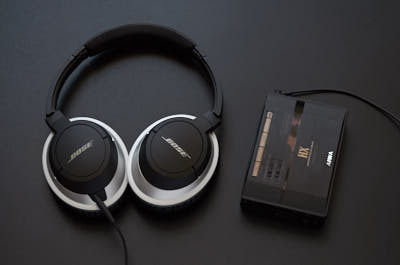 The headphone itself seems identical to the PX101, but now the older pair of connections have merged into one, making it much more convenient. The PX303 with it's remote and headphone. 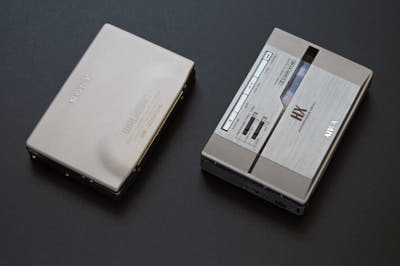 By that time, in '89, seems that SONY did what they had to do and released some technologically advanced models that had similar features like the PX303, with feather touch buttons, autoreverse, Dolby, MegaBASS and remote control. 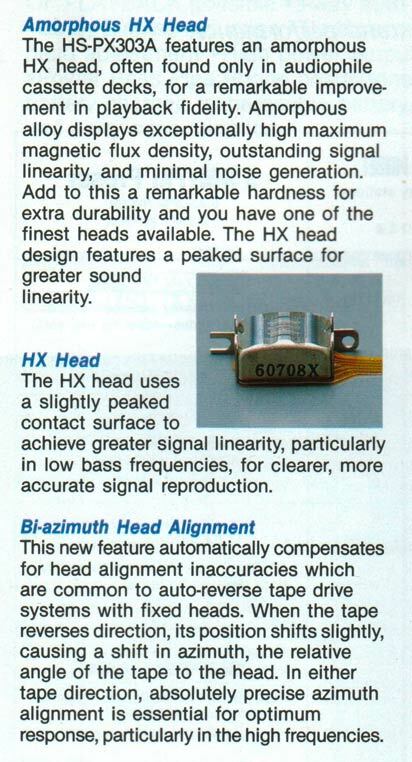 However, none of them had a special amorphous head or Dolby C... except the 703C, a very slightly renewed version of the famous 701C, which was its direct competitor. Both the 701C and the PX303 together. 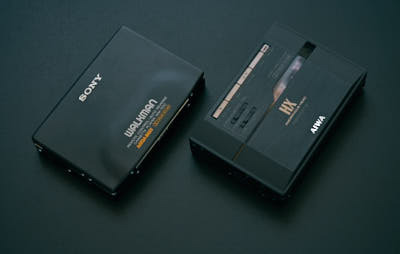 The next competitors were the SONY WM-607 and 609, which were similar to the 701C but without Dolby C and amorphous head. 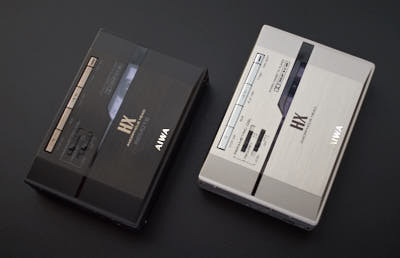 And next to them came mid-class models like WM-170, 171 or the 702. 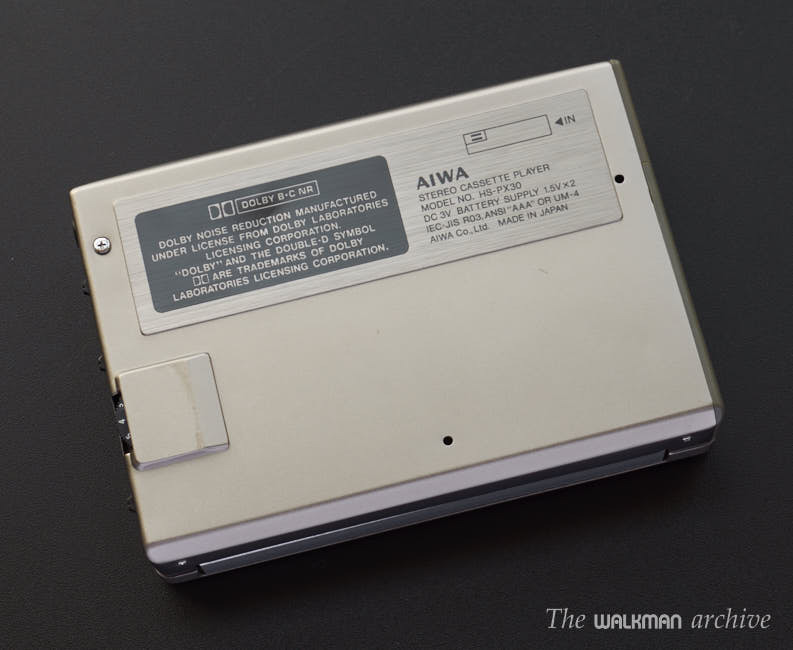 So at this time AIWA was absolutely making one of the world top-class walkmans, together with the WM-701C. And the next year the world will see how they wanted to lead the industry by incorporating BBE sound processor and other exciting technologies. Until now I was using my beloved Super-D6C (an especially modified and upgraded SONY D6C by Dr Walkman in Italy), a very good recording made with in on a SONY UX-Pro and a Senheiser HD280 Pro professional monitoring headphone. But since the last years I had put big interest in learning more about audio quality and trying to find out what's the world's best quality out there, I've improved my listening skills a lot. I had even the chance to listen to a 200,000 € gear in an acoustically aconditioned room, so I guess I could experience that state-of-the-art quality. I also acquired some extraordinary headphones, like the Sennheiser HD650, the famous HD800 and the legendary SONY MDR-CD3000. Many new and extraordinary decks were incorporated to my collection, like a highly upgraded Pioneer CT-F1250, a Nakamichi RX-505, a Revox B215, a Tandberg 3014 or a highly modified Technics RX-B965, so I think I can say I really know good can a tape sound. I also highly improved my listening skills. I can now detect distortions or issues when I heard nothing 4 years ago. However, there's still a lot to learn for me and, but while I feel I'm much better prepared for a subjective evaluation, there are people out there much better than me for doing such a evaluation. The audio tests include an objective test and a subjective test. The results of the first one are shown in the graphs and data; the results of the second one, however, are a personal opinion and they're not intended to be a precision rating. For more information about how do I perform all tests, please take a read on this article. Before rating this model, it was taken to a professional technician for examine, repair and fine adjusting. Remember these are old machines and internal belts stops working properly after some time. Of course, head and rollers have been carefully cleaned and demagnetized before testing. For the testing, I've picked up my 701C (for direct comparison) and let it run for more than half an hour (to warm up). I connected both them to a simple audio switch (no circuit inside) so I can instantaneously switch from one to another. 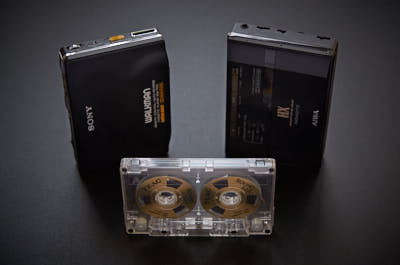 I used two identical Maxell XL-IIs that I recorded exactly the same way, using a deeply cleaned vinyl disc. Of course, I recorded the very same songs, that I carefully chose for having an excellent recording quality and for being excellent samples of how good can a song sound. - I Can't stand the rain by Tina Turner (original USA pressing, mint). All were deeply cleaned and played in my Technics SL1200 LTD with my ANT-Audio Kora3T Limited Edition high-end phono preamp and recorded in my upgraded Nakamichi RX-505. For listening I've used both my BOSE AE2 headphone and my Sennheiser HD650 high-end headphone. I stopped using my HD280 Pro for testing as I realized it has almost no soundstage. BOSE has not a wide recognition in the headphone community for making great headphones. 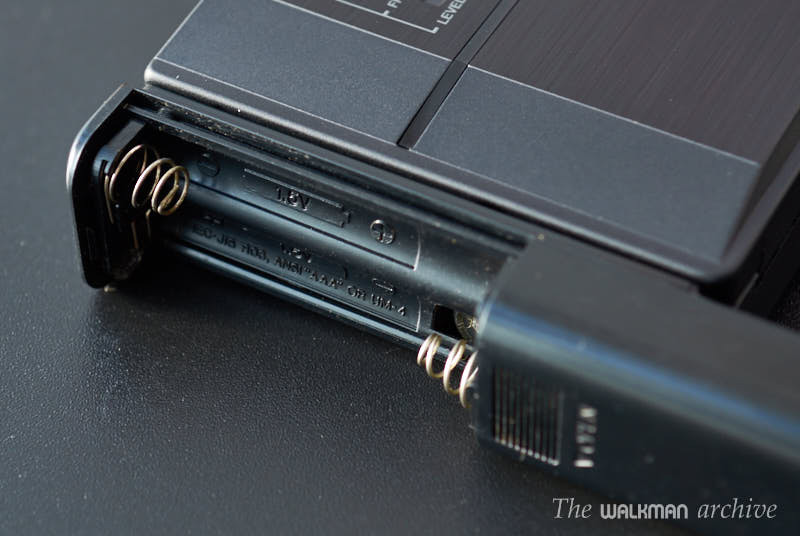 I've read that some of the past models sound bad, and I've listened to some and agreed. But this AE2 is different. As I've already explained in this article, they sound very well and are an excellent option for those who travel and want a over-the-ear (also called closed circumaural) headphone. These type of headphone provides an excellent sound, though not as wide as an open circumaural. And this AE2 is a pretty small one, has passive isolation, can be folded and looks very nice. 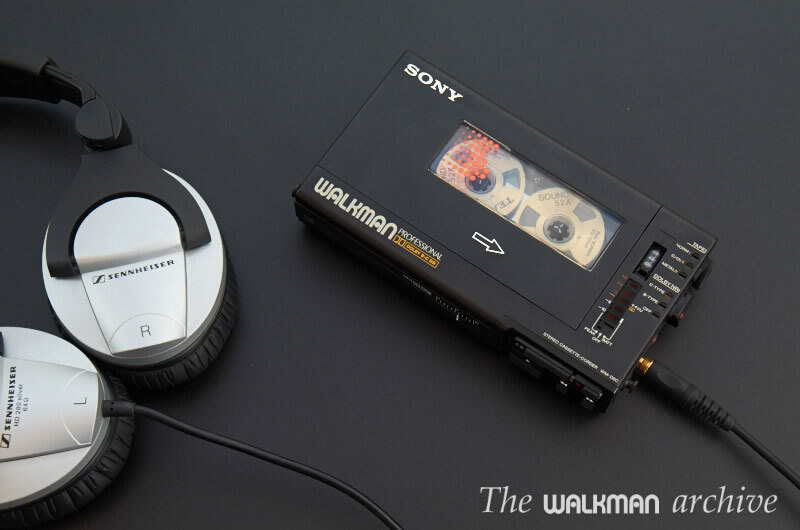 They are targeted to small devices, so there is no problem using them with walkmans as they have low impedance. 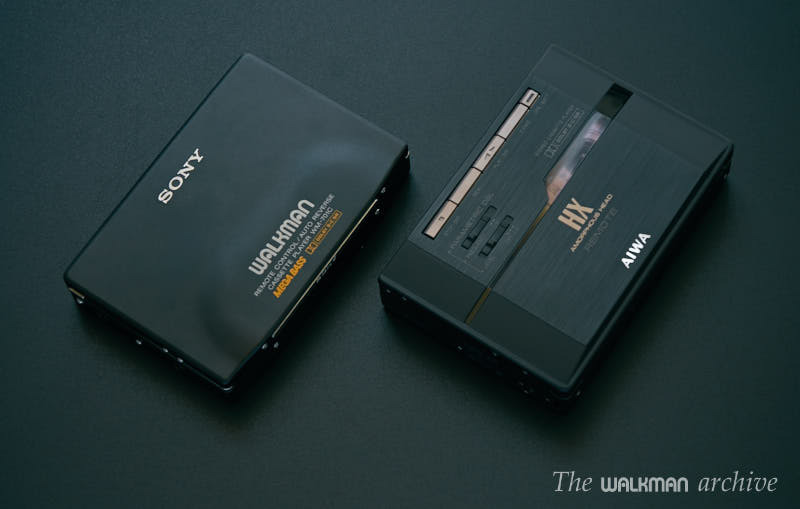 I use the AE2 as my main testing headphone for walkmans because it's a portable one that match perfectly with the main idea of using a walkman. Testing the audio quality of the PX303 with a BOSE AE2 over-the-ear headphone. The Sennheiser 650 is a big one, a bit old but still considered one of the best headphones ever made. And it has a huge number of fans (me included). However it has much higher impedance and it can only be fully enjoyed when using very high quality headphone amplifier, like my ALO The PanAm. 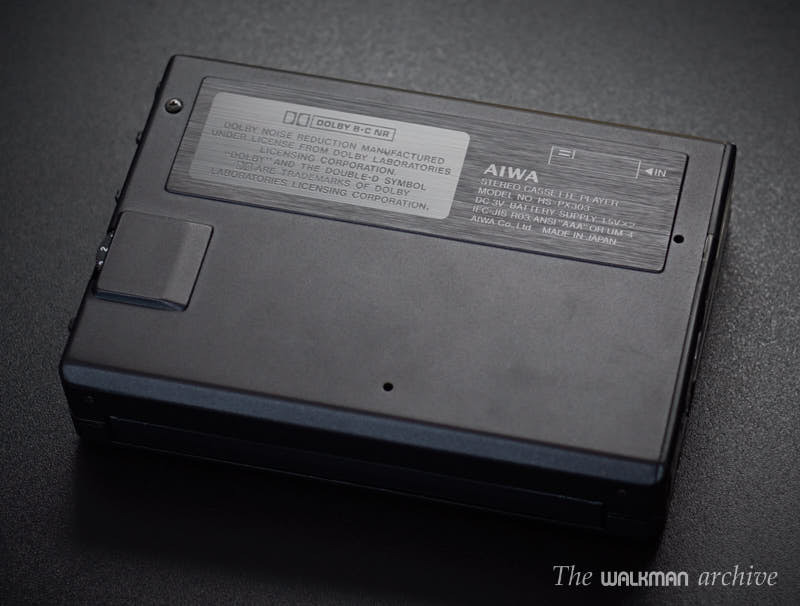 The AIWA HS-PX303 has an impressive sound. It's in pair with the best of the best, really. It's wide, deep and crisp. When compared to the 701C, there arevery few differences. All frequency range sound almost the same. Maybe the highs are a bit higher here, and also the lowest frequencies are slightly more present. All in all the response is truly excellent. The 701C has a sound with a very slight "more body" that surprised me, really. By a slight margin, the 701C surpassed the PX303. A really small margin. Both have a very surprising sound, far from the 'bottled' sound of many low-class walkmans. 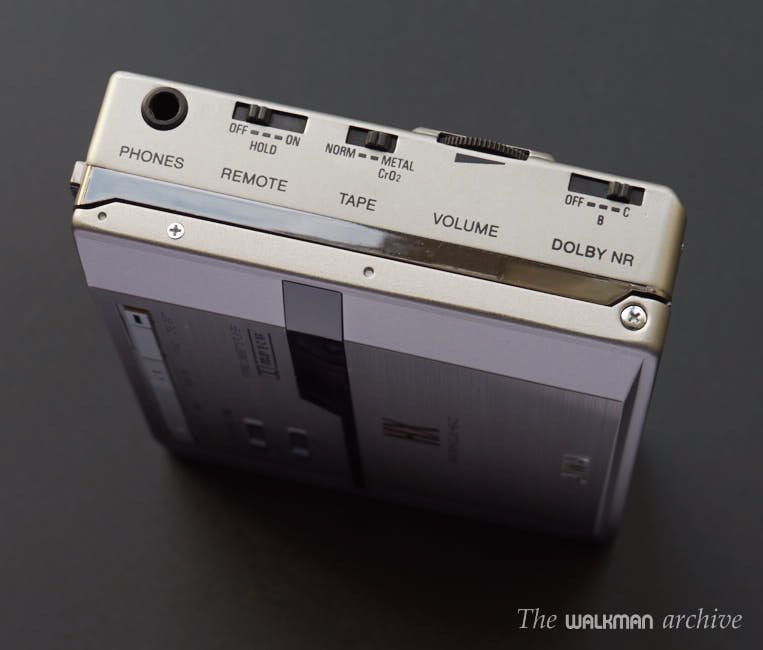 The SONY WM-701C is a very serious contender of the PX303. When you active the bass enhancing system, the H position is a bit boring to me, but the L position is truly outstanding. The bass is clear, powerful and very, very deep. With an excellent recording there's no need to use any enhancing at all. Not even tweaking the tape selector by setting it to 'normal' when using chrome tapes. It's just right as it is. Silver versions of both the SONY WM-701C and the PX303. But if you're a basshead or you are in a noisy environment, you may want to push the bass. And that's when the L position takes the lead clearly. In a somewhat normal or not noisy street the L1 is just right. I've tested it at the street with the BOSE AE2 and they sound perfect. But if you're in a very noisy street or in a train or metro, the L2 is the right one. 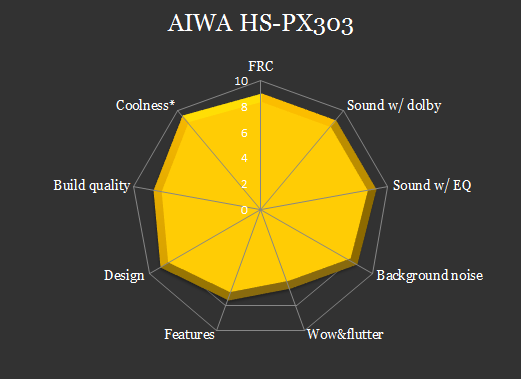 The worst part of using PX303 is the W&F. No, it's not high at all, in fact is almost unhearable... when it's over the desk. But if you're walking with it, then it becomes clearly noticeable. 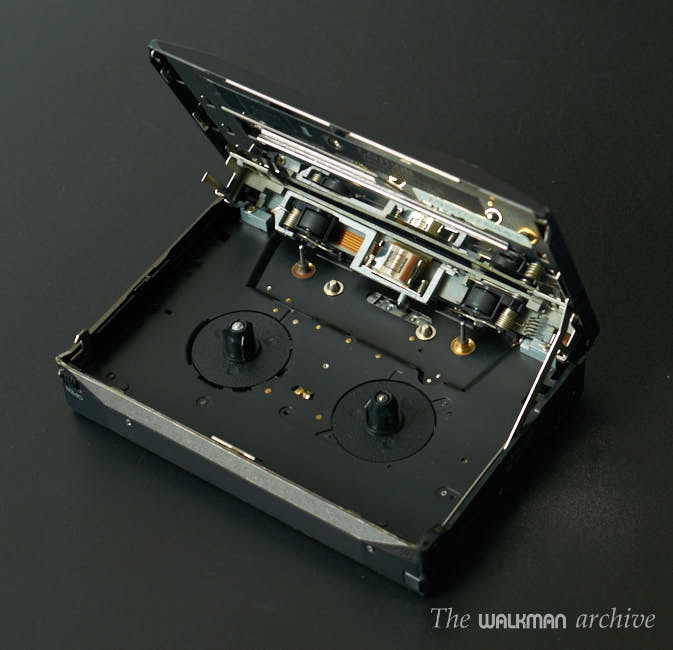 Same for the WM-701 (in fact, this one is clearly worse). So, they are excellent for home or work use but not for walking; even less for doing exercise. In this regards, the SONY DDs are much better. 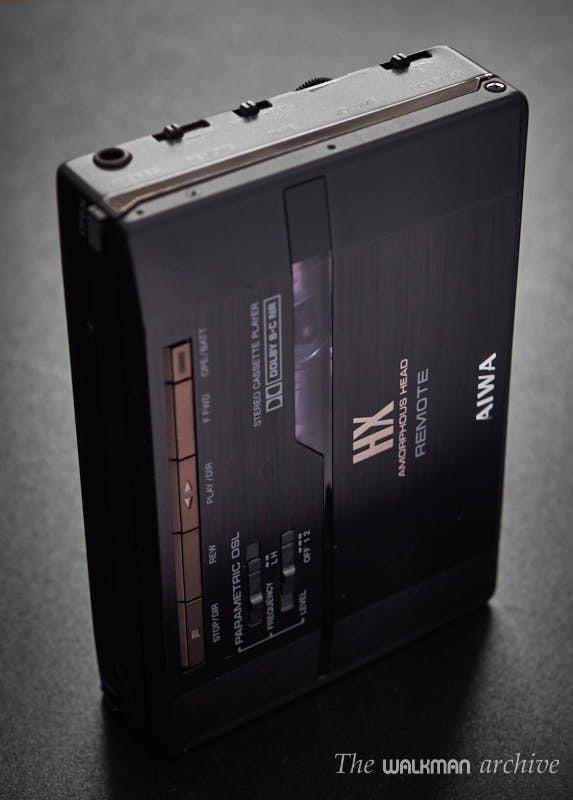 As you can see here, the response of this powerful walkman is almost plain (remember I'm using a top-class UX-Pro chrome tape) from 25 Hz to 14 kHz, which is clearly better than the SONY 701C, especially in lows. The response in highs is very similar to its competitor. Move your mouse over the buttons to see the animation. As you can realize from the interactive images, the PX303 enhances almost only the bass, not the treble like the 701C. 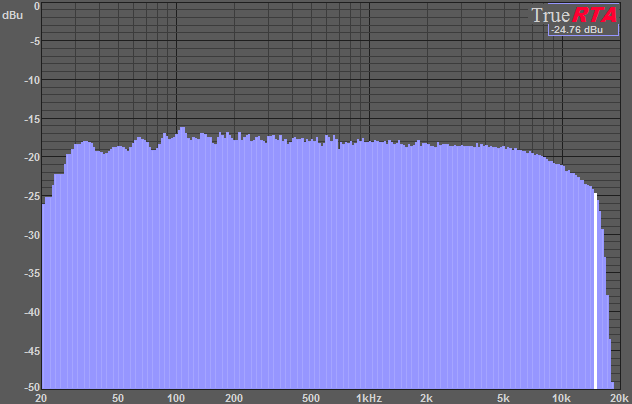 Well, I can say it pushes also the treble but, really, 1-2dB are almost nothing. This can be very useful when you have good recordings with good highs that don't really need to be pushed up. In noisy environments this can be very helpful because in those situations the bass is what's really lost, not the treble. It's also clear that the L position goes very low and deep in the bass, as it can push it up to 15dB at just 30Hz! 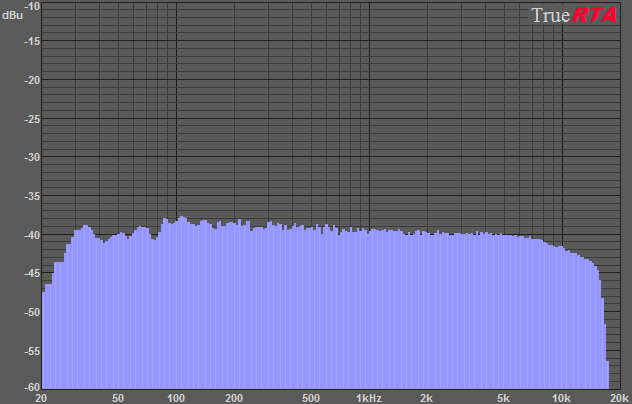 That is really amazing, and confirms the shocking bass your ears can hear when you set the DSL to L2. The position H enhances the bass from 30 to almost 100Hz which makes the bass sound wider and a bit boomy. Another interesting thing is that it doesn't look as a dynamic enhancing because there's almost no difference between 1/2 and 1/4 volume, while the 701C shows clear differences depending on the volume set. It looks more as a static preset EQ. Dolby performance is very good, with just a slight loss of high frequencies (up to 3 dB with Dolby C) and a very powerful noise redution of 10dB with Dolby B and 12 dB with Dolby C, which is more or less the same as the 701C. With Dolby C there's almost no loss and Dolby B works perfectly. The only requisite for this is that recording has a perfect encoding of the Dolby, which is not as easy as it seems. Just by activating Dolby in the deck is not enough. Your deck has to be perfectly calibrated (internally) and you have to record putting care so the levels go up to the dolby mark. For more information, read my guide for excellent recordings. *: The original FRC is measured with a recording without Dolby; the ones with Dolby were each measured with recordings made with the same Dolby system measured. 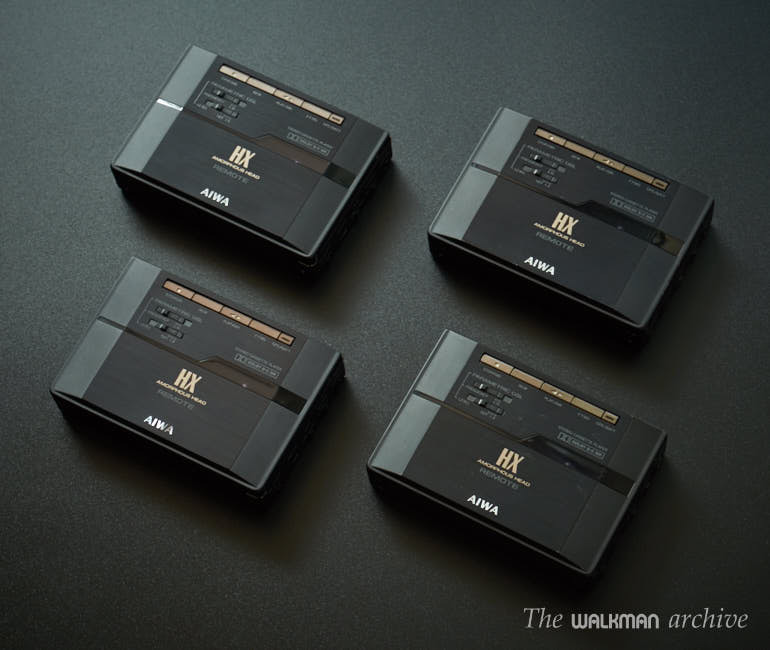 So, up to date I can say that this is, together with the 701C, the best sounding walkmans I've tested so far (excluding the Super-D6C used as a reference, of course). Have you ever seen four PX303 together? 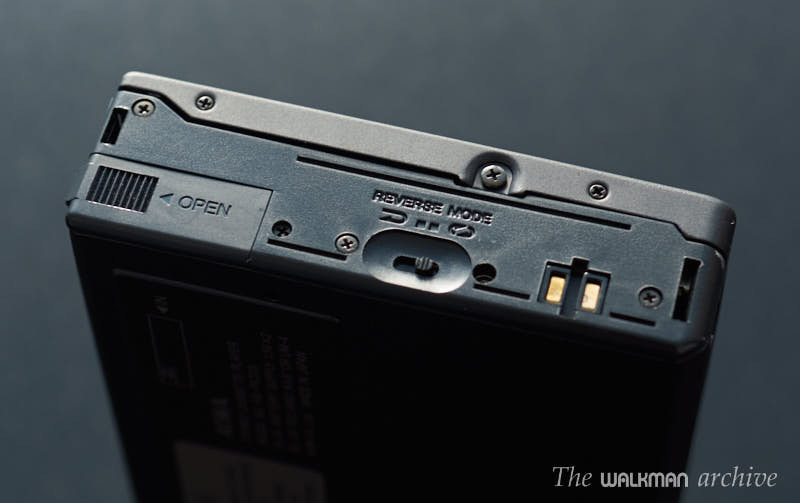 The external battery compartment. The soft case. 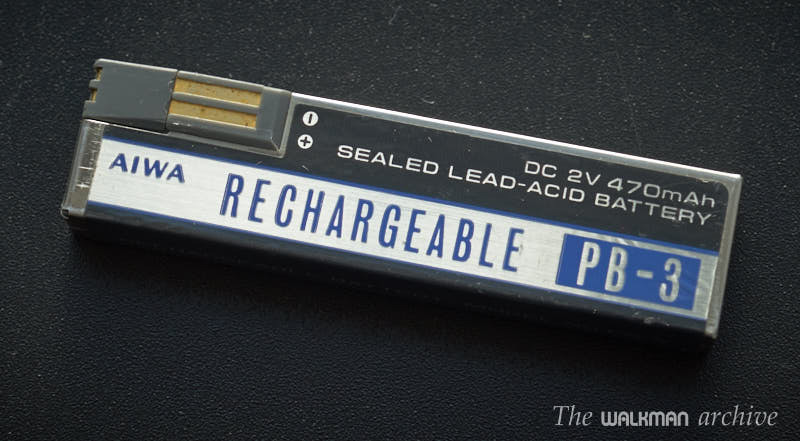 This is the PB-3 plumb battery. We haven't any info about licensed models from other brands. If you know anyone, please send us an email to share the info, and we will update the page. 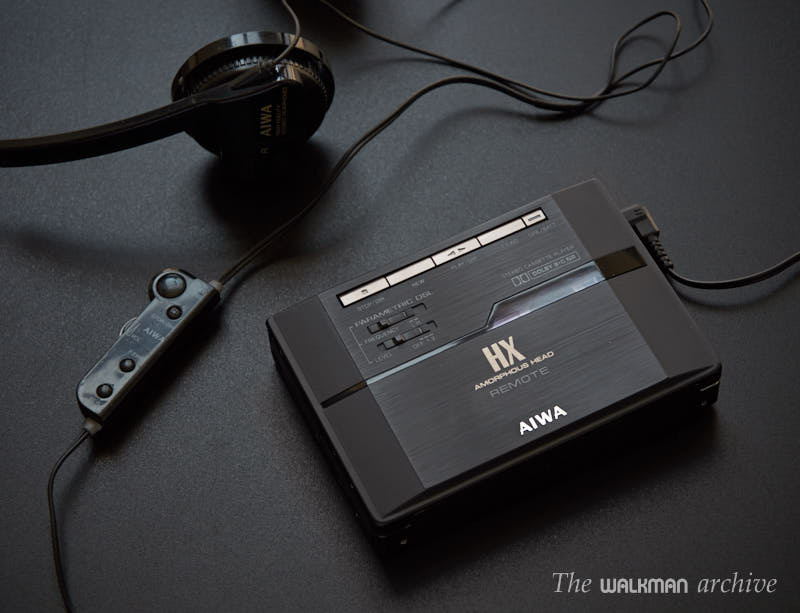 AIWA '89 Headphone Stereo catalogue (spanish). 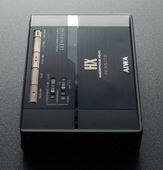 AIWA '89 Headphone Stereo catalogue. This site is free and completely mantained only by me. However, it would be a nice help if you do a donation (even small). You can do it using Paypal (it's secure and fast). 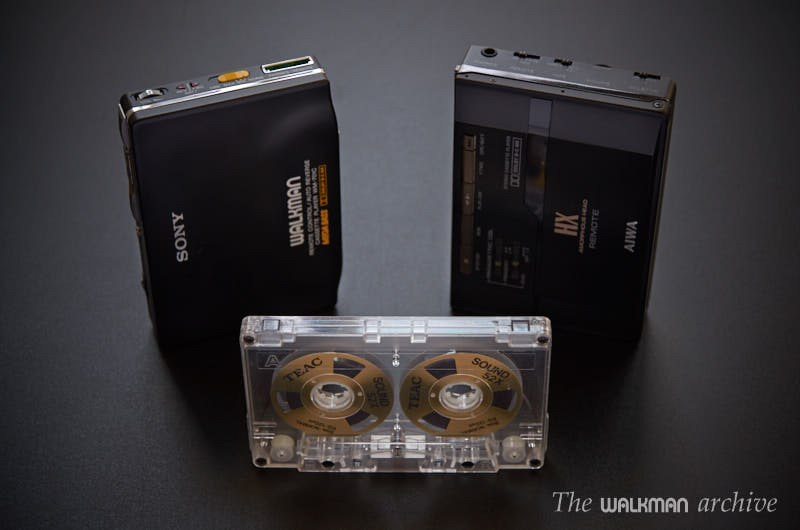 It will help me continue improving this site and keeping alive the memory of those loving walkmans for future generations.